New York, NY, February 15, 2018 –(PR.com)– The Islamic Circle of North America (ICNA) expresses its outrage at the shooting that took place in a high school yesterday in South Florida. 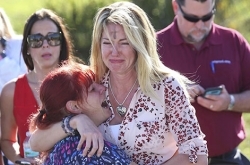 The indiscriminate attack at the Marjory Stoneman Douglas High school in Broward County killed 17 according to the latest media reports. “Our hearts and prayers go out to the victims of this barbaric attack and their families,” said Javaid Siddiqi, President, ICNA. ICNA urges once again to our nation’s law makers to reconsider bills, currently being introduced, that make it easier to obtain and carry guns, and stem this rising tide of vicious gun violence. “By doing nothing about it, by refusing to have a debate about criminalizing the purchase of these weapons, we’re sending this just very strange perverse signal to these unhinged young men who are contemplating these crimes of violence.” – Rep. Chris Murphy (D-CT).